Survivor 2 is held on two tropical islands in the Bocas del Toro archipelago, Panama. Bocas del Toro is Spanish for "mouths of the bull". Archipelago means a large group of islands. 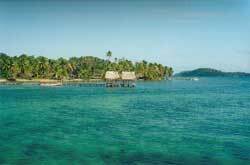 The Bocas del Toro islands are full of lush green tropical forests, surrounded by the crystal blue waters of the Caribbean sea. This fascinating scenario is home for an amazing array of flora and fauna of vibrant shapes and colors, many of them endemic. Beaches are usually narrow, with white sands, full of palm trees and transparent waters. The islands are teaming with life of every kind from the top to the bottom of the rain forest canopy. Troops of howler, white faced and spider monkeys inhabit all of the larger islands of the group. Three and four toed sloths are very common sights as well as numerous different kinds of reptiles, birds, amphibians and sea turtles.